Acquired or Inherited? A eugenical comedy in four acts. By Pansy B. Laughlin, Florence H. Danielson and Harry H. Laughlin. Cast David Reed, a bachelor interested in Eugenics - Frederick Hodge Hannah Perkins, his housekeeper -Florence Danielson Sam, his butler - Louis Poggi. "Jim Weeks", Happy-go-lucky peddler - Louis Poggi. Eugenie Traveller, Eugenics Field-worker - Ethel Thayer. Sophronia Burton, a bachelor maid of forty-five - Florence Danielson. Jerry Dunbridge, indolent and wealthy, in love with Jean. - William Dealey. Lester Gordon, an ambitious electrician, in love with Jean - Tracey Tuthill. Jean Reed, Mr. Reed's niece - Elizabeth Greene. "Hare-lip Peggy" Sophronia's dog - by Herself. 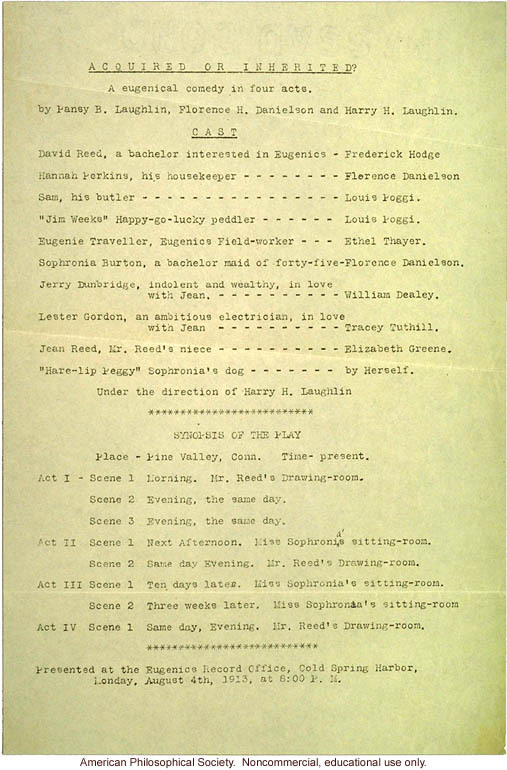 Under the Direction of Harry H. Laughlin Synopsis of the Play Place - Pine Valley, Conn. Time - present. Act I - Scene 1 Morning. Mr. Reed's Drawing-room. Scene 2 Evening, the same day. Scene 3 Evening, the same day. Act II Scene 1 Next Afternoon. Miss Sophronia's sitting-room. Scene 2 Same day Evening. Mr. Reed's Drawing-room. Act III Scene 1 Ten days later. Miss Sophronia's sitting-room. Scene 2 Three weeks later. Miss Sophronia's sitting-room. Act IV Scene 1 Same day, Evening. Mr. Reed's Drawing-room. Presented at the Eugenics Record Office, Cold Spring Harbor, Monday, August 4, 1913, at 8:00 P. M.